Remember the time when party dress shopping was an annual festive ritual? Getting two pair (instead of one)of fancy shoes was a big thing? When eating out every month was almost unheard? And going out with ‘friends Vs family’ was a debate not entertained. These festive rituals which I fondly associated with Durga puja are slowly on their way to becoming extinct. Thankfully food is not a part of this brigade. Food fervor during the festivals is alive, and will always be. 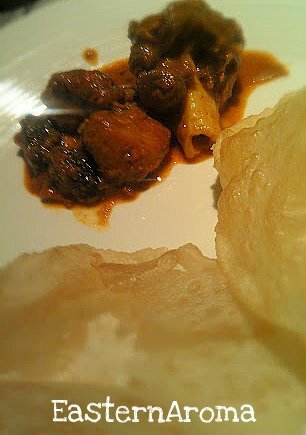 If you don’t agree then you have not tasted the kosha mangsho and Luchi yet. You can plan this dish much ahead and prep it beforehand or ask for extra 5 minutes from the guests who decide to drop in unannounced! What makes it so good and unforgettable? 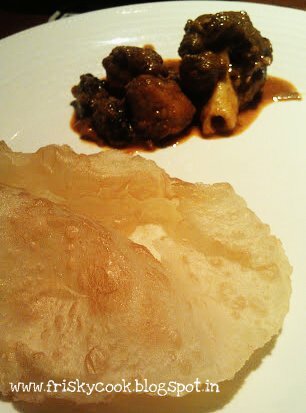 The crisp thin puffed up melt in the mouth luchi (fried indian bread) and soft delectable chunks of bony aromatic mutton (aka Kosha Mangsho). I have to agree, it is one of my guilty pleasures. Knead the flour, salt and sugar in a large bowl. Rub the shortening/ghee into it and gradually knead using enough water to make a pliable dough. Cover the dough with damp cloth and set aside for 30 minutes. Now you are ready to roll. Divide into balls. Now roll out the dough, dip in ghee to avoid the dough sticking. 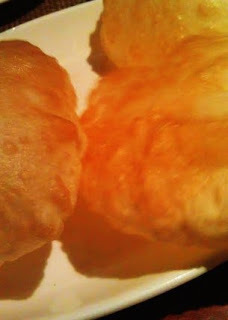 Heat oil , and drop the luchi once its smokey. Watch it get puffed up. It takes about 30 seconds. Flip and fry until both sides are golden brown. Marinate the mutton for 3-4 hours, with all the ingredients mentioned under marination. Heat a heavy bottom Pan and add 1-2 tbsp mustard oil to fry the potatoes till brown. Once done, keep aside the fried potatoes. Now in the same oil, add the remaining ½ cup oil and temper it with all ingredients mentioned under tempering. Add sugar at the end. Fry all under low heat. Now add the onions, and fry till they are golden brown. 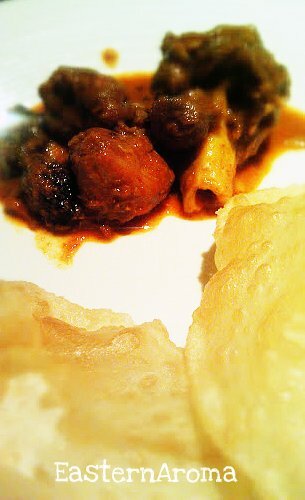 Once done, add the marinated mutton. Fry till the oil leaves the sides of the pan. Transfer the contents to a pressure pan/cooker, add fried potatoes and 2 cups water. It will take around 15-20 minutes. Once you open the cooker, add garam masala. Top it with fresh chopped coriander leaves. Serve with luchi for a festive feel.